Solar systems are designed to take care of most of your electricity needs. Once your system is completely paid for, you will enjoy all the electricity it produces for free. With solar panels having standard warranties of 25 years and electricity prices increasing rapidly, the electricity savings alone make going solar a very good financial investment. Going solar has been proven to increase the value of your home if you own the system. According to the Lawrence Berkeley National Laboratory, an average size system increases your property value by $15,000. Combined with the current tax incentives and subsidies to get solar, buying a system is almost free! Solar provides instantaneous value to you through electricity savings and sustained value through future buyers. Click here to learn more about how solar panels affect home value. Depending on your state, your system may qualify for a personal income tax credit against your state taxes. In certain states, as your solar system produces electricity it also earns Solar Renewable Energy Certificates (SRECs). One SREC is given for every 1,000 kilowatt hours of solar electricity produced by your system. You can sell your credits in an open market or in the Solar Auction. These credits can significantly reduce the overall cost of the system. Homeowners and businesses who purchase their solar systems receive a 30% federal income tax credit for systems placed in service before December 31, 2019. The federal tax credit allows you to claim 30% of the total cost of installing your system. So how does it work? The federal tax credit reduces the amount of taxes you pay to the federal government. If you do not have enough taxable income in one year to use your whole credit, you are able to apply it to future years after installing your system. The federal investment tax credit was just extended, but it won't be around forever. The rate drops to 26% in 2020, and 22% in 2021. At the beginning of 2022 it will expire, so take advantage now! If you have any questions about how going solar may impact your individual tax situation, we recommend that you consult with a tax professional. 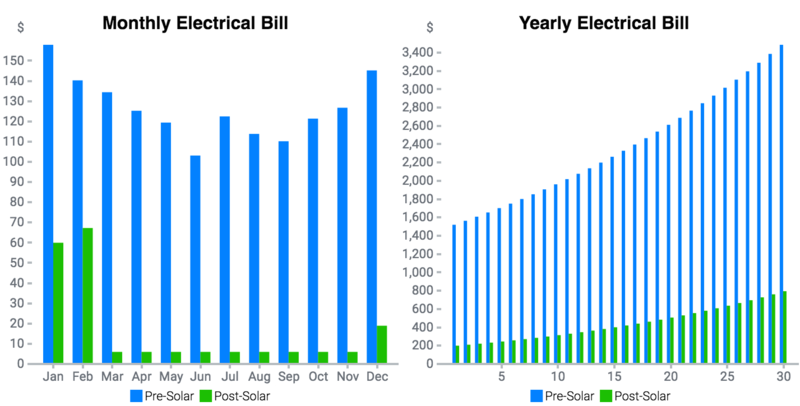 Start with an Instant Estimate of your solar savings!